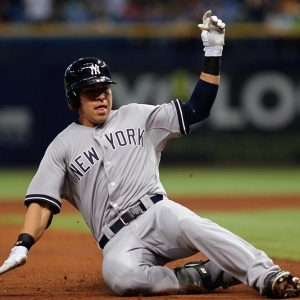 The New York Yankees host the Baltimore Orioles at Yankee Stadium on Thursday. Ubaldo Jimenez is the probable starter for the Orioles and he'll face Masahiro Tanaka of the Yankees. The opening line for this matchup has Baltimore at +148 and New York at -158. The over/under was set at 8. The Orioles have a 38-49 over/under record and a 50-42 run line mark, meaning they cover 54% of the time. The Yankees are 48-44 against the run line and have a 44-44 over/under record. They cover the spread 52% of the time. The Orioles show up with a 46-46 record, including 17-27 on the road. Ubaldo Jimenez has an earned run average of 3.29 and is 7-5 so far on the season while having a 1.28 WHIP. The Orioles are 9-9 over his 104 innings pitched and he's also given up 101 hits over that time period. The Orioles are also 7-9 against the over/under in his starts. He is getting 4.2 runs from the team when he takes the mound. The bullpen's earned run average is currently 2.83 and they've given up 234 hits on the season. The bullpen has struck out 284 and walked 106 batters this season while opposing teams hit .222 against them. Baltimore has a team average of 8.45 hits allowed per game and are averaging 7.81 strikeouts per nine innings. With a team earned run average of 3.73, they are 12th in the league. As a team, Baltimore is batting .257, good for 8th in the league while putting together a .245 average away from home. Ranked at 20th in the league in on-base percentage, the Orioles sit at .311 and they hold a .421 team slugging percentage. With 105 hits, Manny Machado leads the team while his team ranks 13th in hits per game with 8.6. New York is 28-17 at home while holding a 51-41 overall record on the season. Masahiro Tanaka is starting this game 6-3 for the season with an earned run average of 3.65 and a WHIP of 1.03. The Yankees have a record of 9-3 over the 74 innings he's pitched during which he's given up 61 hits. The Yankees are also 5-7 against the over/under in his starts. He is getting 5.5 runs from the team when he takes the mound. The bullpen's earned run average is currently at 3.32 and they have given up 228 hits on the season. The Yankees bullpen has struck out 328 batters and walked 116 this season while opposing teams have hit .209 against them. New York has a team average of 8.71 hits per game and are averaging 8.43 strikeouts per nine innings. With a team earned run average of 3.89, they are 18th in the league. As a team, they are batting .254, good for 14th in the league while putting together a .270 average at home. Ranked at 8th in the league in on-base percentage, the Yankees sit at .322 and they hold a .425 team slugging percentage. With 99 hits, Brett Gardner leads the team while his team ranks 10th in hits per game with 8.72. The Orioles have committed 39 errors and have combined for 855 assists and 2,419 put outs leading to a .988 team fielding percentage. Over the course of this season, the Yankees have accumlated 64 errors while having 873 assists and 2,483 put outs leading to a .981 fielding percentage.